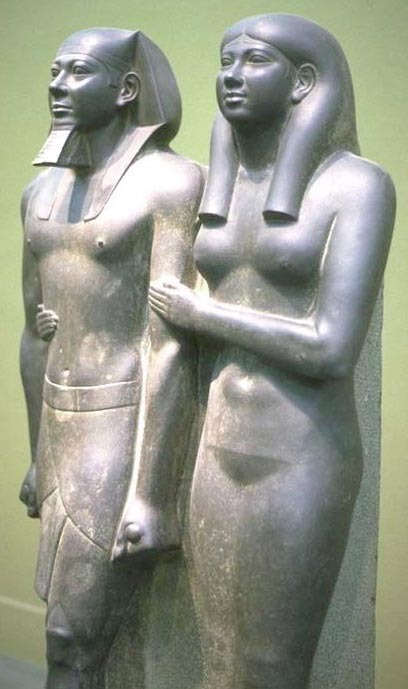 The statue of the Pharaoh Menkaure (Mycerinus) and his Queen in the Museum of Fine Arts, Boston, carved out of slate and dating to 2548-2530 BCE, is an example of Old Kingdom 4th Dynasty royal sculpture. The statue, which stands about 4 feet 8 inches high, was found in a hole dug earlier by treasure-hunters below the floor of a room in the Valley Temple of the pyramid of Menkaure at Giza during excavations undertaken by the Harvard University and Museum of Fine Arts, Boston expedition under the direction of the archaeologist George Reisner in 1908-10. 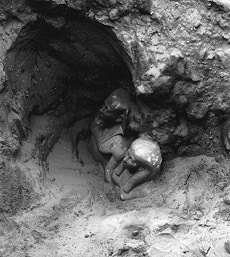 On January 18, 1910, digging revealed the heads of the statue; the following day the pair was completely unearthed [see George Reisner, 1931 in the BIBLIOGRAPHY]. In art history books, the pair have come to represent a prime example of Old Kingdom royal tomb sculpture. The statue exhibits with satisfying clarity the Egyptian adherence to a system or "canon" of proportions and, in its strictly frontal viewpoint, the rigid poses of the figures, an unwavering conformity to rules and established conventions which are interpreted both as manifesting the nature of the pharaoh's authority over his subjects and by extension as embodying the highly regulated, hierarchical structure of Ancient Egyptian society. The forms of the sculpture - the measured grid of strong verticals and counterbalancing horizontals, the stiff, artificial postures, the overall idealized anatomical shapes of the bodies combined with naturalistic details - are read not simply as indicative of Egyptian taste, but as representative of the fundamental character of Egyptian culture. As is so often the case in art history, this sort of extrapolation overlooks or ignores the fact that such sculptures were produced only for a very small elite, in this case the Egyptian royal family. However, perhaps beginning with the Egyptians and prevailing through most of history, it has been the case that the tastes of the elite, and the art produced in conformity with that taste, are regarded as representing the most refined and advanced in that culture.